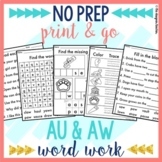 au, aw word work This au/aw Word Work unit includes 12 activities that are ideal for independent work or center work. This unit focuses on the "au" like astronaut and the "aw" like paw sounds. Included in this unit: Page 1: Title Page Page 2: Write the correct au word under the correct picture. 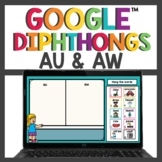 A word search featuring diphthongs au and aw. Great for center work, morning work, or early finishers. Practice decoding words containing au and aw by playing a class game of I have, who has. Up to 24 players. Colored or bw versions included. 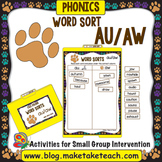 Sort -aw and -au pictures and words. 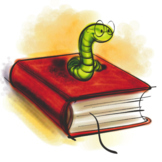 Also read & draw -aw and -au words (this includes an extension version with sentences instead of just words). Students love playing these word games. 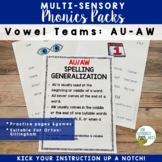 These games reinforce phonics, spelling, reading and vocabulary. 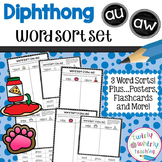 Word cards, Sorting Mats and follow-up worksheet included. Cookies come in black words or white. 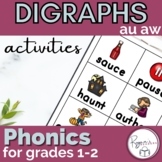 This contains a variety of interactive au and aw word work activities. It could be used whole group on an interactive whiteboard or independently on a computer. I upload it to google classroom and the students complete it during literacy centers.